New York State’s Excelsior Scholarship program has already begun to make its mark at some of the Rochester area’s public colleges. “We’ve certainly seen an uptick in general inquiries and interest in the programs in Brockport,” says Robert Wyant, director of undergraduate admissions at SUNY’s College at Brockport. Signed into law by Gov. Andrew Cuomo on April 12, the Excelsior Scholarship program allows qualified students to attend state institutions of higher learning tuition-free. About 80,000 students could qualify for the aid, according to the New York State Higher Education Services Corp. Lawmakers budgeted $87 million to implement the program in the upcoming school year alone. It does not cover room, board, fees or the costs of textbooks. While local public colleges have praised the Excelsior scholarships, some private not-for-profits have sung a different tune. “When the governor sets up a free state college tuition program, one of the byproducts that he is aware of is that it stands to eliminate the entire private college sector in this state,” says Kenneth Macur, president of Medaille College. Excelsior scholarships are available to full-time undergraduate students who attend two- or four-year state colleges or universities, are U.S. citizens and state residents, and come from families that earn no more than $100,000 a year. That ceiling will rise over the next two years, coming to $125,000 in 2019. Those who qualify will receive scholarships of up to $5,500 annually for as much as five years, depending upon the undergrad program. Qualified students can also obtain an additional $970 in tuition credits per year from their colleges, which are reimbursed by the state. Upon graduating, aid recipients have to remain in New York for the same number of years they received the monies. Borrowers who don’t meet the Excelsior program’s requirements have to pay back the scholarships as if they were loans. New York’s private not-for-profits have not been left out in the cold completely. At the time that the Excelsior program came into being, the Legislature also created the Enhanced Tuition Awards program, which provides up to $6,000 in aid per year to private college students under much the same circumstances. The aid will come in the form of a combination of ETA and New York State Tuition Assistance Program funds and matching monies from the private college involved. Private colleges must enroll in the program in order for their students to tap into the $19 million that the state Legislature appropriated for such purposes this year. Despite its brief tenure, the Excelsior scholarship program has attracted a fair amount of interest. At Monroe Community College, where the annual tuition for a state resident who attends full-time comes to $4,280, more than 800 students had applied for the assistance by July 18. “We’re preparing that maybe 50 percent might be eligible,” says Jerome St. Croix, director of financial aid. Over at Brockport, the possibility of being able to offset the annual $6,670 tuition might have raised application rates. Most students who hope to attend the college tender their deposits before May 1, according to Wyant. This year, more than 185 sent in their money between that date and July 20—more than double the number by the same point in 2016. “This Excelsior program has really helped kind of drive interest later than normal in the recruitment cycle,” Wyant says. Though state colleges’ administrators say it’s too early to tell what the overall effects of the Excelsior program will be, they are preparing to deal with them. Those in charge of Geneseo want to be sure the college can provide the classes students might need in order to meet its requirements. “We want to be sure the campus is ready for this,” Romano explains. St. Croix says MCC’s class offerings are fluid enough to respond to student enrollment. 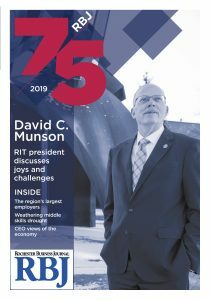 The Rochester area’s private colleges are also preparing to respond to the Excelsior program, in part by emphasizing the benefits they offer. Julie Long, Nazareth College’s chief public relations officer, says her institution has long striven to help its students find the financial resources they need. “Every undergraduate student at Nazareth receives financial aid, and we work proactively and personally with all of our students and families,” Long says. Asked whether the Excelsior scholarships could tempt any of Medaille’s students to head to public colleges, Macur gives a firm no. The college, which has campuses in Brighton and Buffalo, has programs that state schools lack. Tuition for two years of vet tech instruction comes to about $24,000, though the college offers a fairly extensive aid package to vet tech students. Medaille decided not to enroll in the ETA program due to time constraints and other factors. “We just see the entire Excelsior and ETA as a program that is not really designed with student success in mind,” Macur says. Medaille’s vet tech program has only 24 slots at its Brighton campus, out of approximately 150 in all of the campus’s undergraduate and graduate programs. Macur expects the program to double in size in the coming years and says that the rest of his students won’t be tempted away by the chance to gain Excelsior scholarships. Mary Beth Labate, president of the nonprofit Commission on Independent Colleges and Universities, says private institutions’ higher on-time graduation rates make them better bargains in the long run. According to a State University of New York study, 50.5 percent of those who enrolled in four-year SUNY colleges and universities in 2009 graduated on time. By contrast, 53 percent who enrolled in private universities were out of schedule. Labate also warns that over the long term, the state’s new aid program could have an unexpected economic effect upon private colleges’ communities. Public colleges seem ready to take such risks. “We’re excited to see the positive impact this will have on families and students over the next five years, or so,” Wyant says.